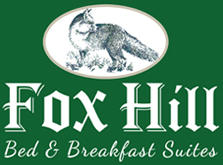 Thank you for your interest in Fox Hill Bed and Breakfast Suites Activity Guide. We request that you provide us with a little information. Fox Hill Bed and Breakfast Suites will use the information you provide on this form to be in touch with you and to provide updates and marketing. We do not like spam! So we practice what we preach, and do not send out many newsletters; about four to six a year. In keeping with the GDPR rules, if you are outside the US, please check the GDPR acceptance box as well as the Email box. PRIVACY NOTE: We will never sell or distribute your information. You can change your mind at any time by clicking the unsubscribe link in the footer of any email you receive from us, or by contacting us at stay@foxhillbb.com. We will treat your information with respect. For more information about our privacy practices please visit our website. By clicking below, you agree that we may process your information in accordance with these terms.